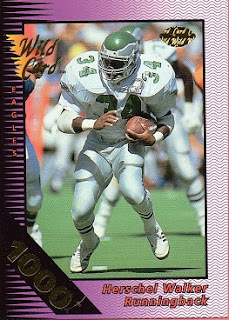 Wild Card was a card company in the early 1990's. Aside from their base sets, they came up with a gimmick. There would be "striped" versions of each card in varying denominations of 5, 10, 20, 50, 100 and 1,000. The higher the denomination, the tougher the card was to acquire, or at least, that was the idea. 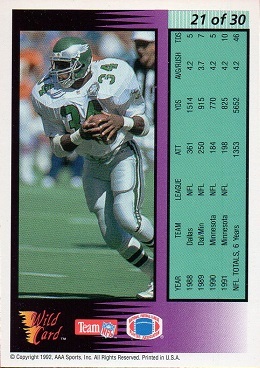 There were subsets of the base set, such as Running Wild, or Stat Smashers, or in this example, Field Force. It never really caught on, and the company wasn't in business for long. But now, for a single player collector, these stripe varieties can be very tough to come by. I was pleased, as I always am, to add a card from Herschel's active playing days, that I didn't own. It fills the bill nicely as card #590 in the Hoard.